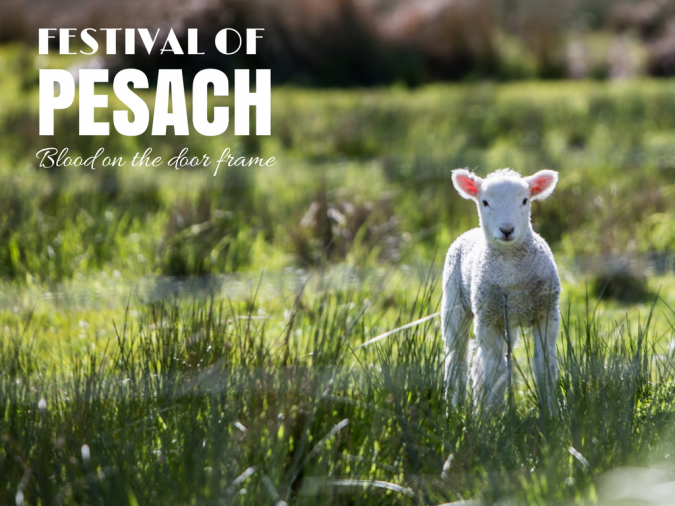 The Festival of ‘Pesach’, which literally means ‘pass over’, refers to the experience of the Israelites in Egypt on the night before they left their slavery behind. The final act of God’s judgement against the gods of Egypt and the people who worshipped them was to kill every firstborn son in Egypt. God sent the Angel of Death out across the whole land, but before that happened, he warned the Israelites through Moses. He gave them a way of avoiding this horrible judgement, and told every family to take one lamb or baby goat and kill it on a certain night, using its blood to paint their door frame, and then roasting its flesh and eating it all before morning. If they did this, the Angel of Death would ‘pass over’ their house. This final plague against the Egyptians forced Pharaoh to allow the Israelites to leave Egypt with all of their possessions. God therefore commanded that the Israelites celebrate this event every year, remembering not only their departure from slavery in Egypt, but also the way that God had protected them from His own judgement before they left. As part of the ritual of the Jewish Passover meal, every one of the ten plagues is remembered by a drop of wine, which looks like blood. Remembering the judgements is also a way of remembering how God’s merciful provision of a lamb protected Israel (even if lamb itself is no longer eaten by most Jews at Passover, out of sorrow for the Temple that was destroyed by the Romans). The instructions about Passover in Exodus 12:1–13:16 and Numbers 9:1-14 speak a lot about remembering, and this seven-day festival must be observed by all Israel every year at its appointed time. It is therefore surprising what Jeremiah the prophet said many centuries later just before the Babylonians destroyed the first Temple: “‘Therefore, behold, days are coming,’ declares the LORD, ‘when it will no longer be said, “As the LORD lives, who brought up the sons of Israel out of the land of Egypt,” but, “As the LORD lives, who brought up the sons of Israel from the land of the north and from all the countries where He had banished them.”’” (Jeremiah 16:14-15) The greater exodus of the Jewish people from their exile in all nations, back into the land promised to their ancestors, will be such a powerful act of Israel’s God, that the first exodus will hardly be remembered by comparison. It is appropriate, therefore, to ask whether the greater exodus from all nations will require a greater sacrifice to come first. What is the lamb that will make God’s judgement ‘pass over’ the Jewish people again, before He rescues them from slavery and restores them finally to their promised land? The last of the old covenant prophets, John the Baptist, described Yeshua of Nazareth as “the lamb of God, who takes away the sin of the world” (John 1:29). The apostle Paul also spoke of Yeshua when he said, “Messiah, our Passover, also has been sacrificed; therefore let us celebrate the festival…” (1 Corinthians 5:7-8). Like the lambs in Egypt whose blood on the door frames caused God’s judgement to ‘pass over’, Yeshua’s blood was put on the wooden frame of the cross, and from the cross He “interceded for the transgressors” (Isaiah 53:12), praying “Father, forgive them; for they do not know what they are doing” (Luke 23:34). The brutal execution of the only perfectly innocent man should have brought God’s judgement on the whole world. But Yeshua’s death actually forgave and caused God’s judgement to ‘pass over’ every human family that chooses Him to be their ‘Pass-over lamb’. Sadly, the leaders of Israel in that generation rejected Yeshua, who wanted to “gather them together” under the protection of His wings (Matthew 23:37). Without His protection, they suffered God’s judgement and were scattered again throughout all the world. But the apostle Paul encouraged us to eat the bread and wine of Passover as a reminder that Yeshua will return again – “For as often as you eat this bread and drink the cup, you proclaim the Lord’s death until He comes” (1 Corinthians 11:26). Why is Yeshua coming back? Partly, He is returning as the Jewish king who will lead his people back into their promised land, restoring the kingdom to Israel (Acts 1:6-7). When He is accepted by all Israel as their Messiah, as the lamb of God whose blood can rescue them from death, then He will complete the greater exodus that Jeremiah prophesied. God will show His power so clearly in the sight of all nations, that the first exodus will hardly be remembered by comparison. As we eat unleavened bread and drink wine, we remember the blood that was poured out for our forgiveness, the pure flesh that was cut and pierced so that we can be rescued from slavery. Tonight, Jews around the world will remember the first exodus from Egypt. Let us pray that they will soon hear and accept the good news that a greater Passover lamb has died for their freedom. Let us also pray that the God of Israel will display His great power in bringing back all the Jews from exile into the promised land, and into a right relationship with their God.